Precalienta el horno a 350°F. Pon el papel para panquecito o muffin en un molde de 24 panquecitos de tamaño regular. Haz y hornea los muffins (panquecitos) como lo indican las instrucciones del paquete; deja enfriar completamente, como 40 minutos. Decora los panquecitos con el frosting o betún. Puedes hacer figuritas de animales como mariposas, abejas, catarinas para decorarlos. Frost cupcakes with frosting. Decorate with whole or cut-up gumdrops, candies, cut-up or thinly rolled fruit snacks and gel to look like ladybugs, bumblebees, butterflies, caterpillars and beetles. When cutting gumdrops, dip knife or kitchen scissors into water to keep from sticking. Look for paper baking cups in festive colors and special designs at your supermarket, party store or paper warehouse. 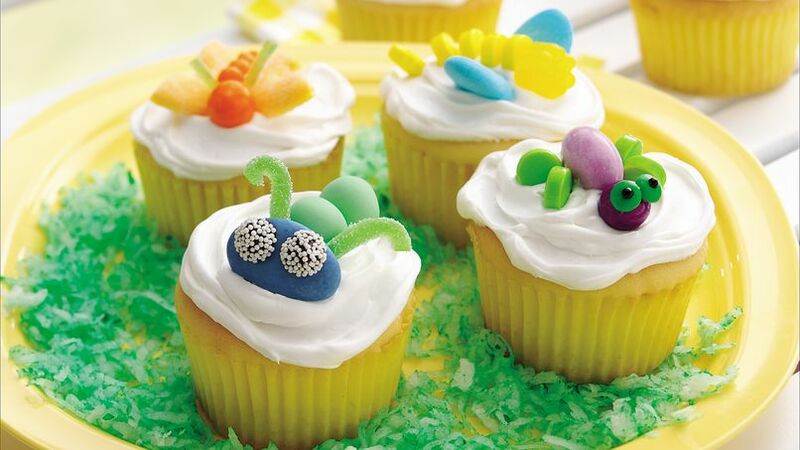 If you'd like to display your bug cupcakes with some green coconut grass, place 2 cups shredded coconut in resealable food-storage plastic bag. Add about 8 drops green liquid food color; seal bag and shake to mix. Bugged with plain old cupcakes? Add some fun decorations, and create a kid-friendly picnic.